Grey Trace has a six-million-dollar death wish. His wife was killed by street thugs, who left him alive, but paralyzed. However, a reclusive tech company founder can repair him with his innovative chip implant. In addition to reconnecting his brain to his spinal column, the so-called STEM AI program also offers helpful commentary directly into Trace’s head. It can even take over his body, suppressing pain and responding with near instantaneous reflexes. Of course, what is the point of all that technology if you can’t use it to get some payback? Trace turns into an augmented vigilante, pursuing slightly less augmented killers in Leigh Whannell’s Blumhouse-produced Upgrade (trailer here), which opens this Friday in New York. It is the near-future, when self-driving cars are finally a reality. Unlike his business-achiever wife Asha, Trace is an analog guy, who makes his living restoring vintage muscle cars for wealthy clients like the Musk-y Gatesy Eron. Unfortunately, on the way home from a delivery, Asha’s self-driving car malfunctions, crashing in the shunned inner-city neighborhood where Trace grew up. Soon thereafter, they are attacked by a gang of savage killers. She dies and he wishes he had too, but Eron offers him a new lease on life. Much to the patient’s surprise, it comes with the voice of STEM in his head. Due to the NDAs Trace signed, he must maintain the public façade of his quadriplegia for the time being. However, this will provide a rather handy alibi when he and STEM start knocking off bad guys. Naturally, the supposedly well-meaning Det. Cortez starts poking around after a few deaths, even though she couldn’t catch any of Asha’s killers to save her soul. Yet, just when Trace starts to get comfortable with the idea of STEM, we start to see potential dangers in relinquishing control of your body. This is, after all, a movie from Blumhouse, the folks who brought you Get Out. Upgrade has the virtue of being less full of itself than the over-hyped Get Out. For most of the film, it is a relatively straight forward vigilante movie, with cyberpunk trappings and enough bloody mayhem to keep the studio’s fans satisfied. Unfortunately, the third act twists are not as clever as Whannell thinks they are. Calling the AI STEM is also an awkward accidental red herring, because it will most likely have kneejerk viewers thinking of stem cells, but the implications of this technology are very definitely a mixed bag. Nevertheless, Logan Marshall-Green suitably intense as Trace. He quickly develops a rapport with Melanie Vallejo’s charismatic Asha, which is a necessary but somewhat frustrating condition for films like this to work. Blumhouse regular Betty Gabriel (Get Out, 12 Deadly Days, The Purge: Election Year) convincingly looks and acts like a cop, but Cortez’s priorities seem a little out of whack. Harrison Gilbertson is too young and dull to believably portray an eccentric genius like Eron, but Simon Maiden nicely follows in Douglas Rain’s footsteps with his smoothly sinister voice-overs for STEM. There are some whizbang fight scenes while STEM is in control of Trace’s body, which might be enough for meathead viewers. There really isn’t much new here, except a contagious mistrust of self-driving cars and considerably more gore than you typically see in cyberpunk and dystopian science fiction. Frankly, the second act is solidly entertaining, whereas the opening is all about tragedy and the closing implodes under the weight of its groaner irony. 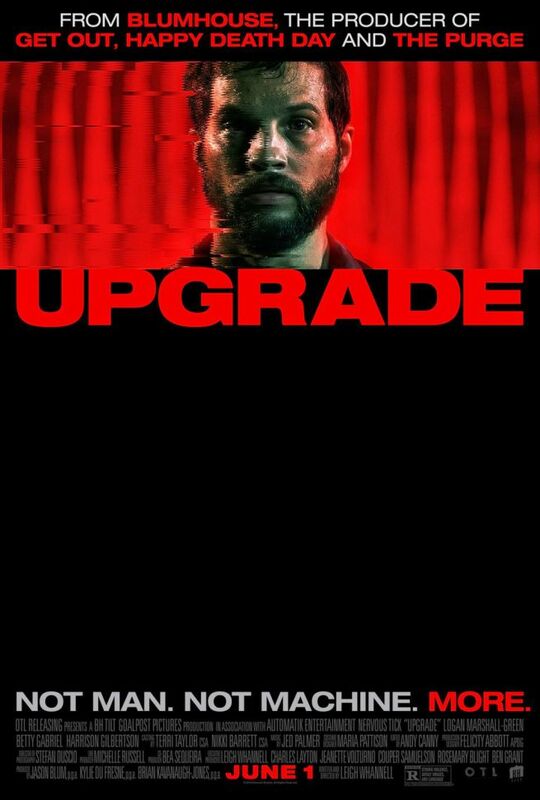 Recommended as an eventual Netflix or Shudder streamer for its good parts, Upgrade opens this Friday (6/1) in New York theaters, including the AMC Kips Bay.